British photographer David Clapp's most recent work captures images from awe-inspiring North American landscapes and rock formations, some with which you'll be familiar, but the others? See the full portfolio here. Gemologist Up to the "Challenge"
The California State Mining & Mineral Museum Association presents "Night at the Museum" on Wednesday, June 22, 2016 from 5:30 to 8:00 p.m. The event features mine tunnel tours, special presentations and demonstrations, giant crystals, fluorescent minerals, and meteorites as well as the 13-pound Fricot Nugget of crystalline gold, and a raffle and silent auction. The museum is located on the Mariposa County Fairgrounds in Central California. Please spread the word! As was presented last year, a symposium is offered on Friday at 3:00 p.m. in English. "From Stone to Wine: Origin of the Diversity of the Alsatian Vineyard and Terroir" in French by Stéphanie Colicchio, geologist and environment leader at the Maison de la Géologie in Sentheim, Thursday, 1 p.m. and Saturday, 3 p.m.
"Wines & Gemstones: An Ancestral Link," in French by Gian Carlo Parodi, mineralogist and lecturer at the au National Museum of Natural History in Paris, Thursday, 3 p.m.
"The Color of Tourmalines" in French by Paul Rustmeyer, Dr. of Chemistry, Friday, 11 a.m.
"Meteorites and Their Impacts" in French by Alain Carion, Sunday, 11 a.m.
"Mineralogy at the Musée des Confluences" in French by François Vigouroux, aassistant for management and conservation of museum collections at the Musée des Confluences (science centre and anthropology museum), Sunday, 1:30 p.m.
"Wine, A Story of Stones?" in French by Marie-Sophie de Maissin, gemologist, expertise and consultancy, Sunday, 3 p.m. Finally, our good friend and mineral dealer Alain Martaud curates The Prestige Exhibition, this year entitled Origins: Stones and Wines. Humans have had relationships with precious stones and the fruit of the vine in liquid form for millennia. Both being products of the land, they are brought together in this exhibition, loosely based on Flashes of Colour: Legendary Wines and Gemstones from 2007. The origin of their color is presented along with the effect of land on grapes (part of what oenophiles call terroir). And the fact that some mineral specimens come from the land of vines also will be highlighted. See the Prestige page for a ruby specimen photo by Mia Dixon, Pala International's resident photographer. Bill Larson provided us with photos of three of the eighteen specimens that Pala will display at the show. They highlight gem crystals from near the Temecula wineries of California's San Diego County. Tourmaline, quartz and albite from the Tourmaline King Mine, Pala, California. For our purposes, we'll look at the crystalline forms of French artist Yann Kersalé's "L'eau dans tous ses états," ("Water in all its states"), although this poses an immediate question, following the recent discovery of a fourth state, discussed below. All the art for the Westin/transit center takes inspiration from Denver's surroundings, and Kersalé sees water in Colorado's vapor, ice, and flows. The escalator linking the ground-level train platform up to the terminal and hotel's plaza level above is quite long, and "L'eau" provides the distraction of a visual experience via variegated projections on a sculptured screen, the light of which reflects off mirrored rock-like protuberances in the passageway's walls. The artist sees the stairway's movement as breaking through the surface of, or being immersed in, its blue fluid, its white clouds and snow. 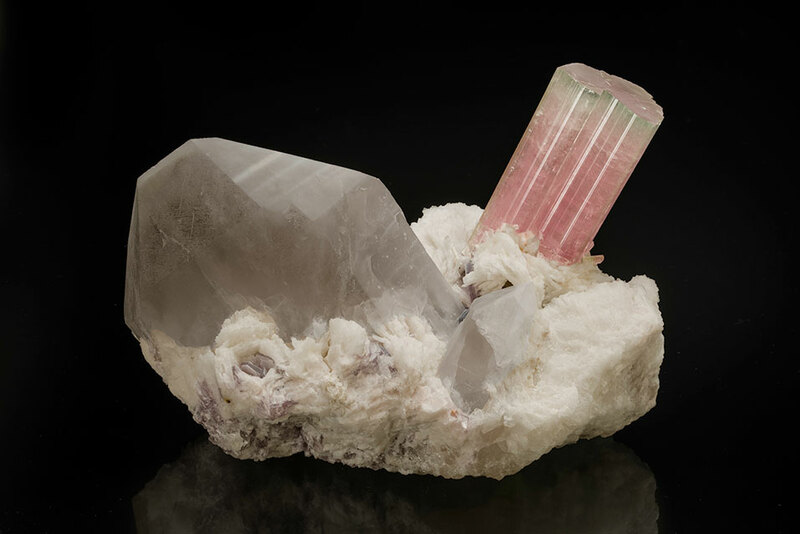 This time we feature a very fine pink tourmaline with a green cap from an unusual locality in Badakshan, Afghanistan. The tourmaline is from the Deodara Mine and sits on a nice matrix bed of feldspars and has a beautiful quartz crystal balancing the specimen on the opposite side. This is one of the largest and finest specimens to come out of this locality. The tourmaline is repaired at the base but it is a lock fit. This is really a choice piece for those collecting fine quality tourmalines/pegmatite minerals. Last month we received a note from Raquel Alonso-Perez, curator of the Mineralogical & Geological Museum at Harvard, who was excited that not only had a new carbon mineral been found (see February's "Carbon Mineral Challenge"), but it is named after a fellow Spaniard—and a gemologist at that. The mineral was discovered by a team led by Dr. Joan Viñals of the University of Barcelona (UB), followed by Dr. Jordi Ibáñez of the Institute of Earth Sciences Jaume Almera. It is a basic lead carbonate and sodium, which is present in crystals and euhedral, subhedral, submillimeter rarely exceed 0,03mm. Grouped forming aggregates and without apparent order in the form of pink, laminar habit and hexagonal colorless and transparent, sometimes white, intense pearly shine glass type, between translucent and opaque, translucent crystals may present iridescence, the crystals are very fragile and friable aggregates is insoluble in water and it is a newmineral training. When Alonso-Perez mentioned the discovery to Dr. Daniel R. Hummer, principal investigator of the Carbon Mineral Challenge, he responded, "Particularly exciting is that a mineral with this formula and structure was one of the specifically predicted minerals in our paper! Score one for science!" The paper in question is "Carbon mineral ecology: Predicting the undiscovered minerals of carbon," published in the most recent edition of American Mineralogist, and written with co-authors including Robert Hazen, who has appeared in our pages on this topic. (The paper is one of many resources posted on the Challenge website.) Dr. Hummer told us, "And of course, part of the reason for doing the Carbon Mineral Challenge is to find out if we can theoretically predict new minerals and then find them, so the fact this has happened once already is encouraging!" There are several references regarding the new mineral, some in languages other than English. And these, for good measure. In other words, "classical" water behavior goes all quantum, as explained by the study's lead author Alexander Kolesnikov of ORNL's Chemical and Engineering Materials Division. "This means that the oxygen and hydrogen atoms of the water molecule are 'delocalized' and therefore simultaneously present in all six symmetrically equivalent positions in the channel at the same time. It's one of those phenomena that only occur in quantum mechanics and has no parallel in our everyday experience." For a lay discussion of these findings, see "Bizarre fourth state of water discovered" at Gizmag. Neutron scattering and computational modeling have revealed unique and unexpected behavior of water molecules under extreme confinement that is unmatched by any known gas, liquid or solid states. Photographer Jeff Scovil contributed to the illustration of this phenomenon, above, with his image of a beryl specimen before an illustration showing the shapes water molecules take on in the mineral's six-sided channels. Below, two more items from the wide, wide world of museum mineral and gemstone collections. We recently received word that the David Friend Hall at the Yale Peabody Museum of Natural History will open its doors to the public on October 23, 2016. Admission to the Hall is included in the Museum's general admission fee. As we reported in April ("And a Carbonite Display?") the Hall will showcase the Peabody's collection of massive crystals, but it also will accommodate lectures, classes, and special events. After the debut on October 23, prospective visitors are advised to call ahead at 203.432.8987 to confirm which halls are open. More information on the Museum is available here. Spring is the time for the Houston Fine Mineral Show, and Pala International's Larsons attended it in April. A happy side trip was a visit to the Perot Museum of Nature and Science and its Lyda Hill Gems and Minerals Hall. If you haven't yet been there, you've likely already been introduced to the Hall in our pages via its signature amethyst geode, below. But there is a special exhibition currently on display through September 5, 2016, Eye of the Collector, and it takes viewers under the skin of—well, we're sure our readers already understand what might drive Carla Eames Hartman to amass a floor-to-ceiling display of PEZ dispensers or Nancy and Randy Best to collect items from time immemorial to the present. Will Larson shared with us two dozen images from Eye of the Collector and more, and we in turn are sharing with you the cream of that crop. Until now, Bruniquel in southern France may best be recalled by foreigners as site of the Cave of Mayrières supérieure, which contained two prehistoric paintings of bison, which were accidentally erased in the course of graffiti removal in 1992. Whatever tarnished reputation today is gleaming with the analysis of the contents of another cave, discovered in 1990, which goes by the commune's name. The cave contained deliberately broken stalagmites arranged in concentric circles. Archaeologist François Rouzaud carbon-dated a burnt bear bone to 47,600 years old, meaning the cave's decoration was the work of Neanderthals, pretty striking given that species (or subspecies) had received a pretty bad rap that was slowly being redeemed over the years. Rouzaud, however, died in 1999, and work on the cave was suspended. As luck would have it, scientist Sophie Verheyden of the Royal Belgian Institute of Natural Sciences, took a vacation in the area of the cave, and questioned why the stalagmites themselves hadn't been dated, a specialty of her own. Turns out carbon dating is useless for samples older than 50,000 years, so the bear bone's dating was just at about that threshold. So she assembled a team use a method of testing uranium levels in sections of the stalagmites both before and after breakage. The age was nearly four times that from carbon dating: 176,500 years. For a very readable account of all of this sleuthing, see "A Shocking Find In a Neanderthal Cave in France" published last month in The Atlantic. Scientific analysis appears to have solved another conundrum that's been on the minds of scientists and others for decades. In 1925, British archaeologist and Egyptologist Howard Carter famously discovered the intact tomb of Pharaoh Tutankhamen. One of the artifacts found inside Tut's burial wrappings was one of two daggers, with an unrusted blade. Such metalwork was not common, and the origin of the blade's iron has been debated ever since, as discussed today by BBC. Two weeks ago, Italian and Egyptian researchers published a paper that they feel puts the matter, well, to rest. Using non-invasive portable x-ray fluorescence spectrometry, they determined the metal to be of meteoric origin. See "The meteoritic origin of Tutankhamun's iron dagger blade" in Meteorics & Planetary Science (doi: 10.1111/maps.12664). For more than a year, BlueCap Productions has held back a long-awaited documentary on tourmaline from the Pederneira Mine in Minas Gerais, Brazil, the subject last year of an entire edition of The Mineralogical Record. New developments at the mine caused BlueCap to take a step back and take more time to include new material. The result is Pederneira: A Rainbow of Colors, and Mineralogical Record subscribers are receiving a free copy of the DVD in the May/June 2016 issue. An HD digital version of the documentary is available for streaming and/or download. For the physical DVD, visit the BlueCap website. To receive a 10% discount, be sure to enter the code palaintl when you’re asked for it while ordering. What was once a coffee planation now produces fruit of the mine. This brief trailer gives a sense of the amazing variety of tourmaline coming out of the Pederneira Mine. Click here to view the trailer. If it weren't for fire, we wouldn't have ice, as in the igneous rock known as kimberlite pipes that, often enough, produce diamonds. The depth of their development, over 150 km below the earth's surface, provides the pressure required for diamond formation. Kimberlite magma pushes to the surface, creating pipes. With luck those pipes create diamonds. The explosion to the surface was described recently in a story posted by Canada's Diavik Diamond Mine operator Rio Tinto. The firm's process technology superintendent Yuri Kinking likened the pristine tundra's disturbance to the Apocalypse, with ash on the surface and holes "down to the bowels of the earth." In December, Rio Tinto unveiled The Diavik Foxfire, pushed nearer the surface by one of these fiery explosions. At 187.7 carats, it is Canada's largest gem-quality diamond ever to be recorded. If volcanic conditions can be harsh, so is the Diavik Mine, in the Northwest Territories, not far from the Arctic Circle. It's a brutal environment; in winter temperatures can reach nearly -60° F and otherwise it is surrounded by the water of melted glaciers. The mine is protected by dikes, like a Netherlands of the North. Not until things dried out—operations began in 2003—could the diamonds suspected of being there be accessed. Perhaps a bigger surprise than The Foxfire's discovery is that it simply should not have been. The ore processor was calibrated to discard the diamond as worthless ore since diamonds that size weren't supposed to there. It would have been crushed had its elongated shape not saved it; it literally fell through the cracks of the filtering screen, as explained by Bloomberg. The Foxfire, which has been on a tour from its home to Kensington Palace to New York to Israel to Antwerp, was supposed to be auctioned in late May, but no sale had been announced before e-press time. We will update this story accordingly. Last month, in our sibling publication, Palagems Reflective Index, we featured the first batch of forty mineral and gemstone postcards published by the British Museum. This month we add ten more cards. According to a story by postcard-collector John Taylor in the Jan/Feb 2009 edition of Rocks & Minerals, these cards were printed in about the 1920s by Waterlow & Sons. The firm was an engraver of currency, postage stamps, and stock and bond certificates. James Waterlow's son Sydney (1822–1906) eventually became Sheriff of the City of London, during which time he was knighted, and later became that city's Lord Mayor. We've culled from the larger group ten cards that depict crystal forms. We'll feature some more cards in the June edition of Palagems Reflective Index. As we often do, here we offer an April item from our sibling e-publication, Palagems Reflective Index. Enhanced Spectrometry, aka EnSpectr Raman, has a line of laboratory and handheld Raman-luminescent solutions for speedy non-destructive identification of gems and minerals, requiring no sample preparation. While the Mountain View, California firm's products have been available for years, its website's marketing appears mainly aimed at users wishing to identify explosives, poison, narcotics, and such. A 2014 information sheet sheds light on its gemological and mineralogical applications. RaPort is a handheld spectrometer that interfaces with a Windows or Android smartphone or tablet. RamMics M532 is a Raman-luminescent microscope for lab use. See the latter instrument in action below. A scope-less R532 also is available. More information on application of these products is available at the EnSpectr website. The firm's YouTube channel has ten more streaming videos for viewing.